The walls of the studio are covered with posters and printed cloth from Japan. The miniature sculptures that adorn the bookshelves and window ledge mirror the artistic expression of illustrator, designer and comic book artist Bendik Kaltenborn. Although calm and collected, there’s a spark in his expression. His sturdy hands rest on his lap, his eager eyes reveal a man ready to take on any challenge. "Whatever I do, it’s related to drawing. I don’t have any particular ritual, I just put on the speakers and find some suitable music. If I’m drawing a comic strip I need something soothing, without a lot of dialogue, but when I’m colouring a poster, for instance, I’ll listen to something playful and energetic." Coincidence and experience shape the nature of men and determine the paths they follow. As a boy, Kaltenborn used to drift away in class, away to his private universe of drawing. Fantasy, fighting and art. He didn’t act out, but because of his lack of concentration in class, his teachers threatened to send him to a school for children with learning disabilities. With this threat hanging over him and his parents worrying about his future, he quickly shaped up and started paying attention at school. From then on, drawing was associated with playtime. Not with school, work or a career. Nevertheless, his passion for drawing never abated, and the further along he got in school, the more he picked up classes that pointed towards the creative sphere. 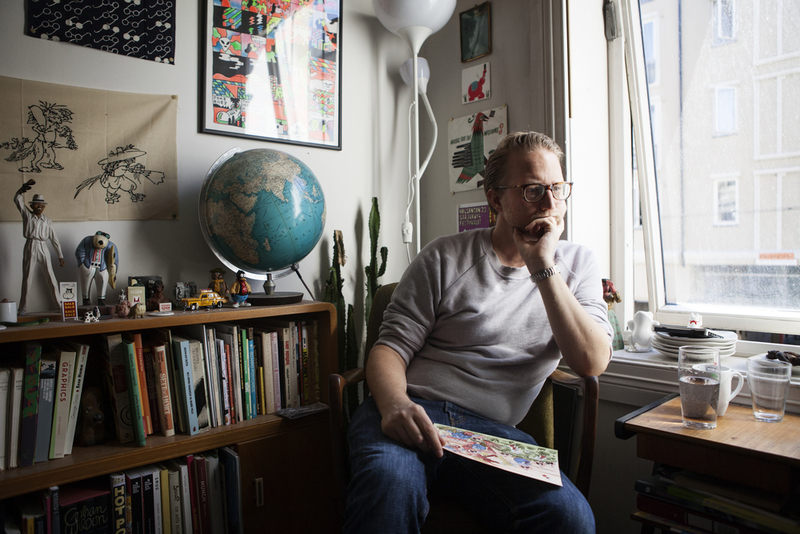 His high school friend Kristoffer Kjølberg introduced him to Photoshop and InDesign, and Kaltenborn soon realized there were several ways to approach a career in drawing. In 1997, he and Kjølberg established Dongery, their own comics collective which created comic strips. After completing high school, Kaltenborn was accepted into Oslo National Academy of the Arts (KHIO) to study visual communication. He continued drawing comics for Dongery, which were popular but left him with no stable income. After graduating from KHIO he worked freelance for a couple of years until he began a master’s degree in graphic design and illustration at Konstfack University in Sweden. Although he had a solid education and had now won several prizes for his comics, there was still more to come for Kaltenborn. In 2010 at a comics fair in New York he ran into an acquaintance who had just been to the New York Times and obtained a commission. Doubtful yet hopeful, Kaltenborn followed up with an e-mail and was invited to a meeting the very next day. He brought along a selection of his work and was given a deadline to complete the illustration for a book review of Beatrice and Virgil by Yann Martel. He was excited about such a big opportunity but met with an unfortunate setback. As a plume of ash from a volcanic eruption in Iceland spread across parts of Europe, Kaltenborn was stuck in a hotel at Heathrow. Luckily a friend who was travelling with him had a laptop and drawing pad, so Kaltenborn had no choice but to do the drawing at a rotten airport hotel. It was successful. Shortly after he delivered the illustration, Kaltenborn got in touch with the New Yorker. He’s now been working for the New Yorker for the past three to four years and has a resumé of around 200 illustrations big and small. He’s also become one of Norway’s most renowned comic artists at what is probably only the beginning of his career. His schedule may be packed with drawing, but Kaltenborn has not lost touch with his inner child, who loves drawing day and night. "He’s actually still a big part of me, maybe even too big. I’m still muddle-headed and childish, and definitely the same boy, but it’s no longer about what I can’t do; now it’s about what I can do." The return of the boy lost in fantasy that Kaltenborn once was is most pronounced when he’s on holiday in his cabin in the woods. Here Kaltenborn loses all his inhibition and draws just for his own enjoyment. When he’s working on commissions he’s often chained to the drawing board, but at the cabin he can go back to the traditional style, using pencil and water-colours, and spend several days on a single drawing. And the drawings he does at his cabin are sheer madness. Dreadful-looking characters drenched in blood are not an unusual sight. One horrid creature with claws and a fiery red, raw face can be seen in slightly modified form in several of Kaltenborn’s drawings. "I don’t know who or what the creature is. I try to frighten myself. When I’m alone inside my cabin I get a little frightened when darkness falls, and I think I try to trigger something within myself with my drawings." Kaltenborn has been terrified of werewolves ever since he was a child. He shows one of his drawings. It’s set in the woods, and he’s taken the face and fur of a wolf and crossed it with another phobia: the spider. The very drawing is unpleasant, and almost any audience would provide the reaction that Kaltenborn is after. Terror. Kaltenborn draws his inspiration from several sources that have in some way or another been formative to his work. He mentions well-known Norwegian artist Theodor Kittelsen, known for his nature paintings and illustrations of fairy tales and trolls. Colleagues Lars Fiske and Christopher Nielsen from publishing house No Comprendo Press are also people he admires and is proud to work with. But Kaltenborn is also inspired by other media platforms. He mentions David Lynch as an all-time favourite. Lynch’s mysterious and unsettling way of telling a story and unique dramaturgy are things that Kaltenborn has drawn inspiration from and incorporated into his own work. "I like making comic strips without the use of classic dramaturgy. It’s usually the last square in a comic strip that has the punch line, but Dongery and I try to play around with the possibilities and mix things up. Maybe have the punch line in the middle instead." By stirring up the order of the squares in his comics, Kaltenborn is again striving towards the disturbing feeling that Lynch is known for. He frequently receives comments about the horror and uncomfortable feelings stirred by his drawings, but these he takes as compliments. Although he seeks to use not only fear but also humor as an instrument. He mentions Lynch again, and Lars Von Trier’s television series The Kingdom as examples of humor and fear going hand in hand. He says they enhance one another, without leaning too far towards either of the genres. But he does admit to a tendency to use a lot of silly humor in his work. Kaltenborn usually keeps his peers in mind when he’s working in the comic collective Dongery. He considers what they would find funny, and strives to achieve just that. “Bad humor can be funny too,” he exclaims. So the comics that are read by the many are meant for the few, but apparently these few have good taste, as so far Kaltenborn’s works have been very well received. While Dongery provides a creative haven for Kaltenborn as an artist, he also receives commissions that require him to think in new ways. Recently he was asked to decorate a historical monument in Oslo’s Aker Brygge district – a large clock. He was limited to using gilt copper to decorate the green background of the clock. The brief also specified capturing the essence of what a working day used to be like in the area. "I did a lot of research on this project. I really wanted to treat it respectfully. It was such an honour, and because the procedure would be irreversible I had to do my very best. It took me about two weeks in effective working hours." And two weeks of work is a lot of time for the 33-year-old, as he constantly has new projects lined up. Kaltenborn’s book Liker stilen will be published in Spanish, German, French, English and Swedish next year. On the side he’s been working on a long comic strip for the past six years, as well as drawing posters and album covers on commission. This year he’s also making a music video for the song “svensk sås” by electronic musician Todd Terje. In this case he’s been given free rein, as there’s no time for instructions. When previously working with Todd Terje, he experienced pushing his limits as he had to cooperate. 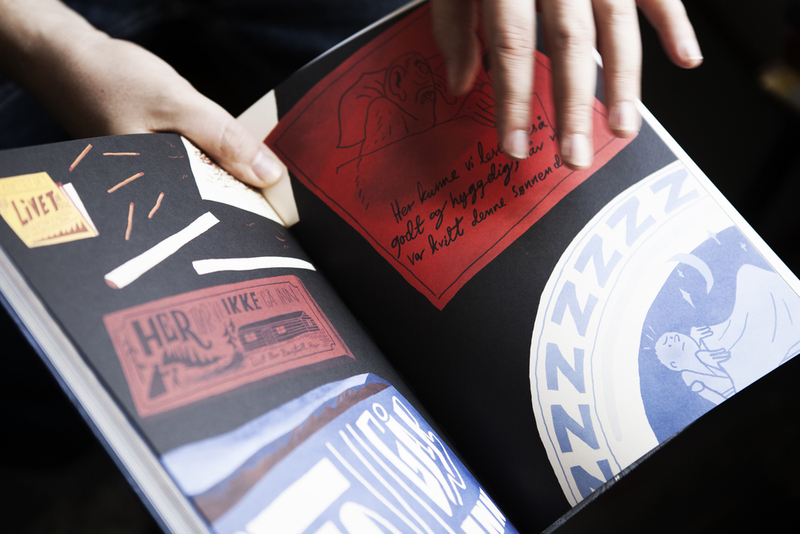 "While illustrating the covers, Terje and I had a lot of discussion. He gave me feedback and comments that gave me that extra push. In most cases I’ve been happier with the result than with the original drawing." The whimsical artist doesn’t think he’s reached his full potential yet. On the contrary, he thinks there’s much more to come in the future. "I’m still in the process of developing as an artist. I’m often afraid of repeating myself and falling into a rut. But I want to keep going, and although my drawings may be recognizable, I want them to keep varying and reach new levels."